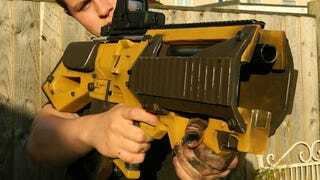 300 hours and $200 was enough for popular modder Ikkalebob to build the real-life version of the Dahl assault rifle from Borderlands. It even has a working sight and with the tweaks he made it just looks really powerful. Here are some cool shots below. Head over to Ikkalebob's gallery on Instructables for more pics and for detailed step-by-step instructions on how to build this beauty.